I had quite a bit of teal BlueSky Alpaca left over from the crochet dress I finished in Nov. Love the colour so much - not one I would've considered before my best mate's wedding. Seeing as my new year's resolution this year was to make more stuff for myself than anyone else, I've decided I need something to brighten up the multitude of black in my wardrobe, needs to be multifunctional - warm up a tank for a summer evening & keep the cold out in spring & summer. 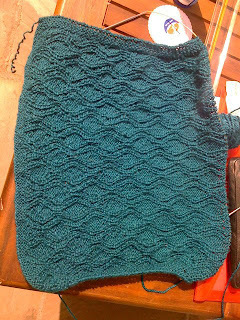 Keep seeing shawls that turn into shrugs popping up everywhere so let's have a go at one of those. Dead easy once you've picked the pattern you want on the thing - make sure it's wide enough to go round my bingo wings and remember to put buttonholes every 10cm in the border on one side for the length of an arm at either end (I've ripped it back a few time having got carried away in the knitting). So this is where I'm at with it. I started it in a flight to Bali at the end of March thinking it would be a good holiday project. But I didn't like the pattern I picked and 35C + humidity don't mix well with wool. Anyway, ripped the whole lot back when i got home & started again. Hope to finish it by the end of May. Then planning to start an openwork black Cashcotton one with some kind of sparkle (beads or lurex, can't decide).